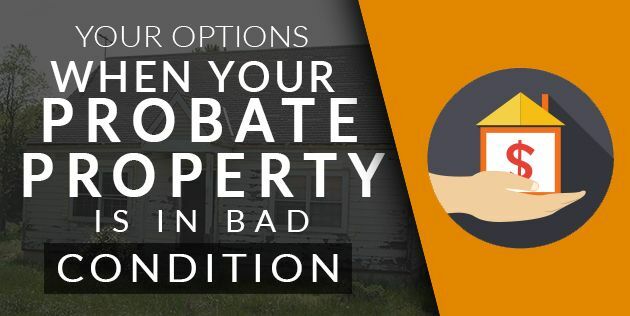 What Are Your Options When Your Probate Property is in Bad Condition? What Are My Options When My Probate Property is In Bad Shape? Home » Blog » What Are My Options When My Probate Property is In Bad Shape? Unless you come from a rich family, you’re probably not inheriting a fully staffed manor with marble floors so clean you could serve a meal off of them. You’re probably inheriting a regular property that’s been lived in for a long time, and could use a little work. Getting the home fixed up involves a lot of work. If you aren’t doing the work yourself, it involves a lot of time and money. You’ll find yourself in one of three situations: you have a lot of cash to play with and want to maximize your profit on the home, you have a little bit of cash you can use to prepare the home for serious buyers, or you want nothing to do with all the home’s issues. You may find yourself in a position where you only want (or need) the money from selling the property as-is, and that’s okay too. If you got this property through the probate process, you’re not out any money. Everything left after taxes and paying the mortgage debt goes directly into your pocket. If the property is in bad shape, you can maximize your profit by fixing the home. Homes that need a lot of work won’t sell for very much, but perfect homes sell for a lot. If the property is very old,the kitchen and bathrooms might need work. It may be worth the money to spruce them up. Just be careful about what you decide to do. Things like room additions may actually hurt the value of the home, and experts say some updates boast no return at all. If the home has serious problems that need to be addressed in order to sell it, like leaky roofs or flooding basements, handle those first. No one will care about new counter tops if they have to put buckets in their kitchen to catch rainwater. It only takes a small investment to make a home look move-in ready, and you can do a lot of the work yourself. You want all your windows and doors to be intact, none of your walls to have holes in them, and none of your floors to be peeling or stained. Old carpets will have to go, water damage will have to be fixed, and you’ll need to make sure the plumbing is in order. Then you can move on to simple things, like fresh paint. Cover old paint with neutral colors, like creams, beiges, and tans. Replace cracked or yellowed switch plates and outlet covers. Slap a new coat of semi-gloss white on the baseboards, crown molding, and door frames. Focus the rest of your energy on getting the home spotless, and cleaning up the yard. It won’t cost you anything to mow the grass or trim the trees. Pull the weeds out, and clear any garbage out of the front and back yard. Work your way inside, scouring every counter top and scrubbing the grout with a toothbrush. The things you couldn’t afford to replace will begin to look new again. Remove any clutter to allow the features of the home to shine. This means packing up the personal effects that are still lying around the house if you haven’t already done so. Make sure you’ve checked the attic for anything that you may have forgotten. If you want the process to be as swift as ripping off a bandage, you can sell the house “as-is” without any hassle. All you’ll have to do is take what you want with you and leave anything you don’t. You won’t even need to clean up. It’s hard to find an agent for a beat up property. Even if you do, you won’t get full market value. If this is the type of solution you’d like then your best bet is to turn to an investor. An investor won’t give you full market value for your probate property, especially if it needs a lot of work. Instead, you’ll receive an offer that omits the cost of necessary repairs and desired improvements. You won’t have to shell out any cash to get things taken care of. You won’t have to pay any fees the way you would with a realtor. If you’re just looking to see the end of the situation, investors can lend you a helping hand. Here at So Cal Home Buyers, we have been helping sellers for over 10 years find solutions to their real estate problems. If you don’t want to agonize over preparing your home for sale, and you don’t have the funds to invest in the home yourself, we’ll gladly take over for you and pay you a fair amount in cash. Contact us today for a fair cash offer on your property, and let us do all the hard work for you. « Previous Post How The Legal Process Affects Your Ability to Sell a Probate Property Next Post » What Resources Are Available To Help Me Through the Probate Process?